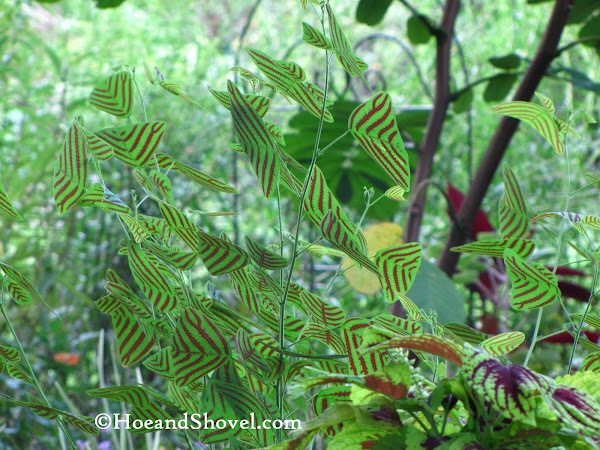 Of all the plants in my garden it is the Christia obcordata 'Swallow Tail' that gets the most attention from onlookers these days. The first time I spotted it, I was just as intrigued as everyone who has seen it since it came home with me. It was at my favorite local garden center in late July. Without knowing too much about it I snagged up three of them and knew immediately where they would be sited. The three container gardens at the curvy pathway leading into the tropical pathway from the circle garden were in need of a switcheroo. Gently leaving the fillers and spillers in place the 'Swallow Tail' was added for the thriller element. It's not like me to purchase a plant I don't know anything about. But with this one I had that inner-instinct it would work out. Besides, its winged leaves were so attractive it was worth taking the chance. There isn't much information on the Internet about this one. But I did find this document confirming it would require the filtered sunlight offered in the location I had in mind. With a fresh layer of potting mix added at the time of planting, the soil is kept moist allowing it to almost dry out in between watering. No fertilizer has been applied. 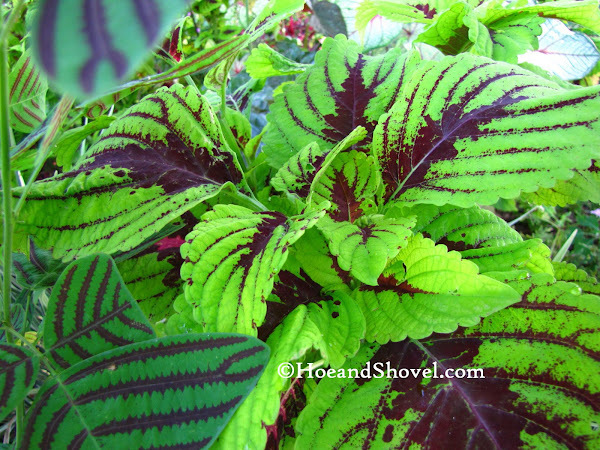 A close-by neighbor to the 'Swallow Tail' in the adjoining border, the broad-leaved chartreuse and eggplant-hued coleus of the Kong variety, complement the color combination. From the back side it is easy to see how the leaves appear to be floating along in the air just as their living namesakes do. Attempting to capture the flurry of actual swallowtail butterfly activity commonly occuring each day in the circle garden, the 'Swallow Tail' plant in the background mirrors the flight of nectaring butterflies. An unplanned surprise noticed when looking through the photos. 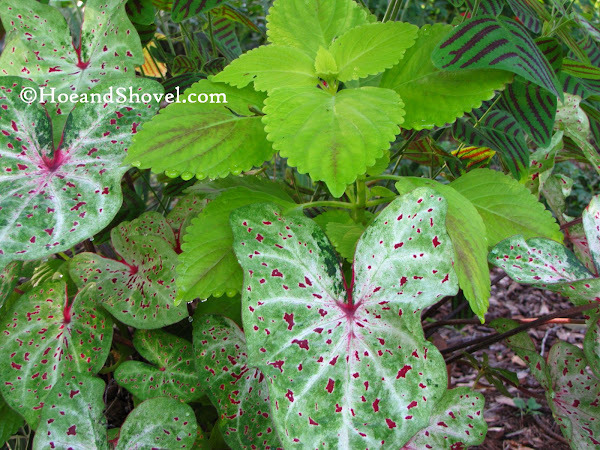 Miss Muffet Caladiums fill in at the bottom of the airy stems of 'Swallow Tail'. And a favorite chartreuse coleus of an unknown name ~~ but it's chartreuse and that makes all the world right. 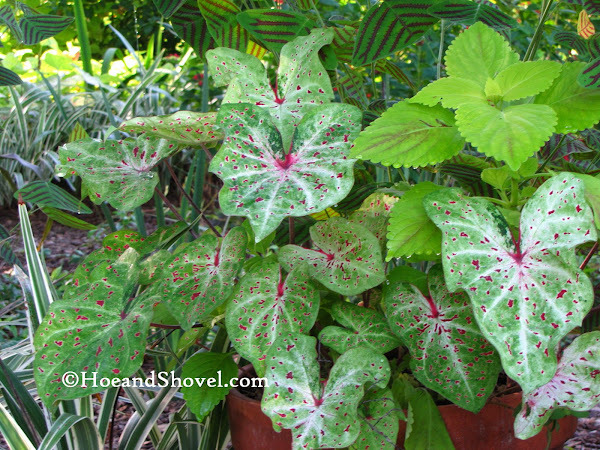 Gingerland caladiums pour over the sides of another container. Interestingly, the references I've been able to find identify this uniquely colorful plant as a perennial and is noted to be in the bean family. 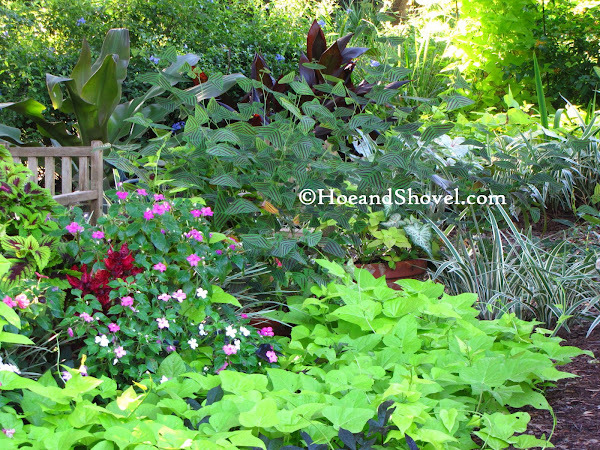 A few weeks ago Hoe and Shovel hosted a small get together of a few gardening friends and close-by Florida bloggers. Each guest took home a cutting of this wistful new-ish plant. Then when they got home I think almost every one of them searched their own garden centers for a mature 'Swallow Tail' of their own. Photo courtesy of NanaK (thank you) of My Garden Path (not pictured sadly). I didn't take a single photo that day... too busy chatting away. It rained on us that morning, too, so we are all a bit weather-worn. You ladies are so fun! From L to R standing in the circle garden: Susan of Simply Susan, Chris of The Great Wall, Janis of Graceful Cottage Gardening, Brando of A Ponderer Digresses, Me, Marie, Rhonda of Garden Almanac, and Sherry. I've recently taken some cuttings to try the 'Swallow Tail' as a root cutting. I do know it lasts very well in water as I've placed them in cut flower arrangements in vases with good success. In the early morning streams of first-light beam through to spotlight the airy branches of one of the containers. It has been an unexpectedly exciting addition to the garden for its unique characteristics and ease of maintenance (so far). But the mere vision of it brings lots of oooo's and ahhhh's and makes it a great conversational piece, too. The cuttings I got from you have all taken,thankfully.And are growing quite merrily.It brings such a joyful spot to the garden,soesn't it? Thank you,again,for hosting a wonderful garden party. Great post about this nifty plant. This is ONE COOL PLANT! It will be fun to see how it does all year 'round and IF it blooms, you'll probably get some nice seeds since it is in the bean family. What a beautiful specimen! It's so amazing and I love it paired with the chartreuse-colored plants. Looks like you ladies had a wonderful, rainy day to enjoy the garden. 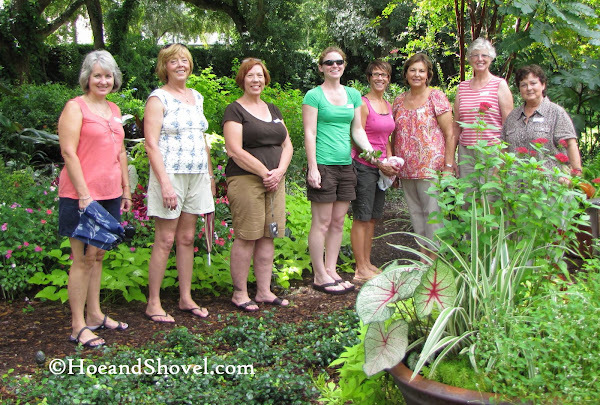 Hey Meems, isn't it great when garden bloggers meet in your garden? That swallowtail plant has caught my interest. I wonder how well it will grow down my way. 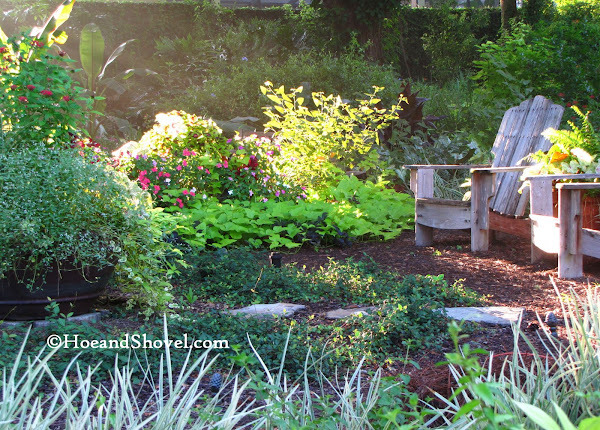 Your garden looks awesome and I am sure your guests were mesmerized by it. Hugs to you my friend. Wow, that is quite a dramatic plant-like a bunch of lovely butterflies in flight. 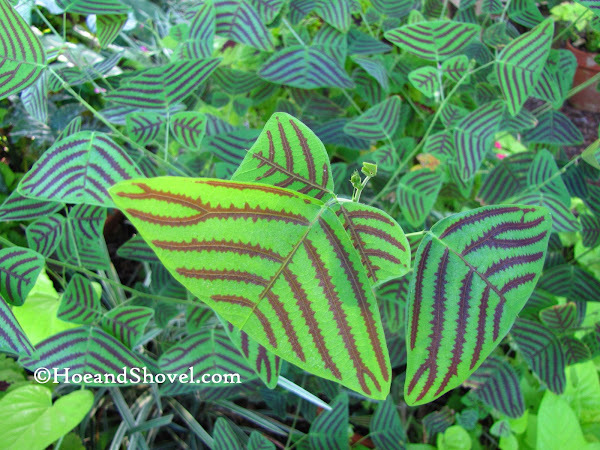 Dear Meems, What an amazing plant the 'Swallow Tail' is. This is certainly something which I have never come across before now but would love to have if I thought that there was any chance of keeping it alive, let alone obtaining it. It looks superb in your garden. I hope it roots easily....I'll be on the look out for this plant myself. I love it! Oh, it's good to hear they are rooting. The ones I just started didn't seem to even wilt when put in the soil. It looks like this will be an easy one to root. It could turn out to be sensitve to cold but we won't know about that for several months. :-) I'm crossing my fingers for blooms and beans... more interesting features. It has been a sweet addition that acts right at home here. Yes, it turned out the rain was a blessing to cool us down in August. YOU should have been in our group photo. :-) I think it would be perfect down your way and happy straight through winter. Miss you and (((hugs))). Thank you, the swallow tail did seem to snuggle in here quite like it belonged. I had never seen it prior to coming across it that day in the garden center either. I'm so glad I forked over a little extra for them because they have been well worth every extra penny. It's looking very promising on the root cuttings. I'll keep you posted. 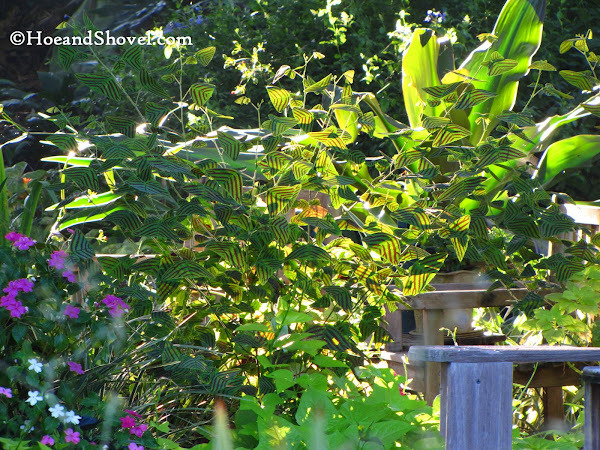 That plant has certainly caught my eye on a couple blogs this summer. Very unique! Don't know how I've never seen it. I will be on the lookout for this at our local nurseries. This is such a beauty! 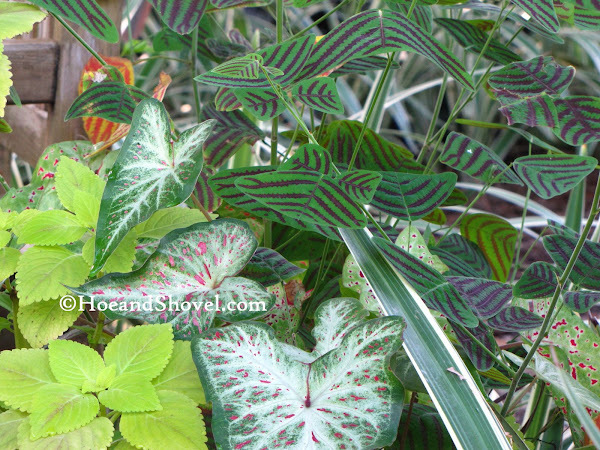 Love the way you combined it with coleus and caladiums. The color and texture complete each other so nicely. It is for sure on my watch list now! Hi Meems...It sure is a unique plant. I wouldn't be surprised to see this plant become very popular in the near future. It was definitely fun visiting you in your garden and meeting all the others. Thanks for hosting it. 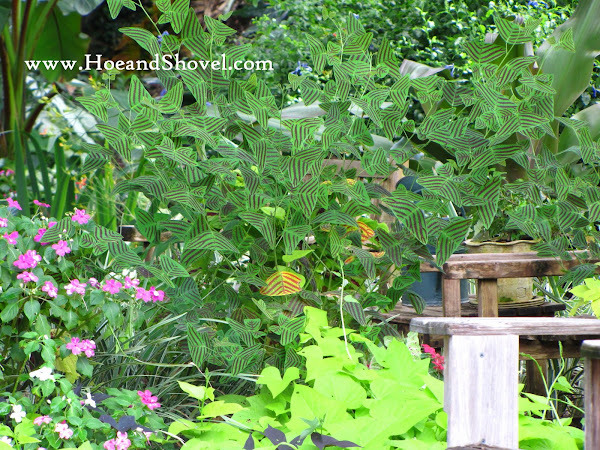 wow, that swallowtail plant is really eyecatching. I love how the foliage sits on their stems - I bet it's quite a sight with a little wind. Must have been a fun get-together. I think it's really neat that you didn't know the swallowtails were there until looking at the photos. That's what's neat about taking photos outside with digital cameras. I find that sometimes the sun won't allow you to see the image, and you actually may not know until you see the photos exactly what you have. 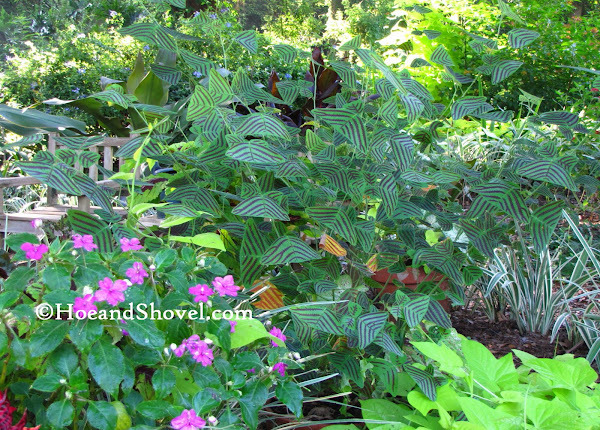 The swallowtail is a very interesting new plant, and I've gotten a few comments from visitors since it arrived. The garden party was so much fun. Hi Meems. Wow, I have never saw that plant before. What a fantastic plant it is and with the right name too. 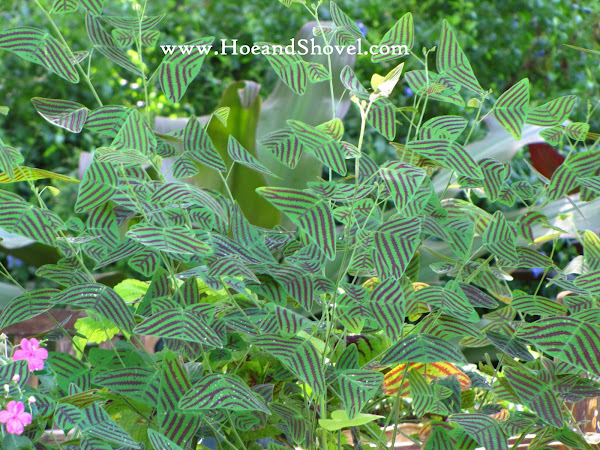 I just love the variegated leaves that look like butterfly wings. It goes so well in the spot you have for it with your other plants. Beautiful! I am oooing and aahhhing and I will probably never even see it in person. What an unusual plant. It is beautiful too. I hope it is a good one for you. What fun it is to get together with fellow bloggers. Meems, now that it is spring again I was wondering how your swallowtail plant made it through the winter. Unfortunately mine didn't. Everytime I write your name I think you must live in Siesta Key... One of my favorite places in all of Florida. Someday maybe you'll start a blog???? Anyway, it's funny you should mention this now. Just THIS week 3 or 4 from this group of gardening friends (also featured in this post) were standing around laughing about the swallowtail plants that didn't make it. We all agreed we would go buy them again, however, if they become available this year. They were a mid-summer purchase and I yanked mine out of the containers they were in back in November. They had gotten leggy and yellowy and I needed to spruce up the containers they were in. Friends that had them planted in the ground had the same issues. Maybe we'll all have better fortune with them this year!!! They are too much fun to be without. I am just now discovering you and am becoming obsessed with finding the plant "Chrisita Obcordata" Swallow tail plant. I was wondering you or anyone else can give me information on where I can buy this plant. I live in Fort Myers, FL. Thanks in advance. I just found a christia obcordata at pottery express &bamboo in punta gorda. I had never seen it before. The tag says it can take direct sun, but filtered sun is best? How long lived is it? Any suggestions? Love your pictures. I came across this beautiful plant at a farmers market and snatched it right up. Then I started searching for what I had. I will also try and root it with plant hormone but am not sure it will take. I was told it is hard to root. i just purchased a new home that has this plant already here. The location is in direct sun light for most of the day and it is growing really well. I wonder how I am supposed to prune this plant. its already at 4 feet high and i notice the bottom of the plan is very bare with leaves. so it shows a lot of stem. I've not had success with Christia lasting past one season. 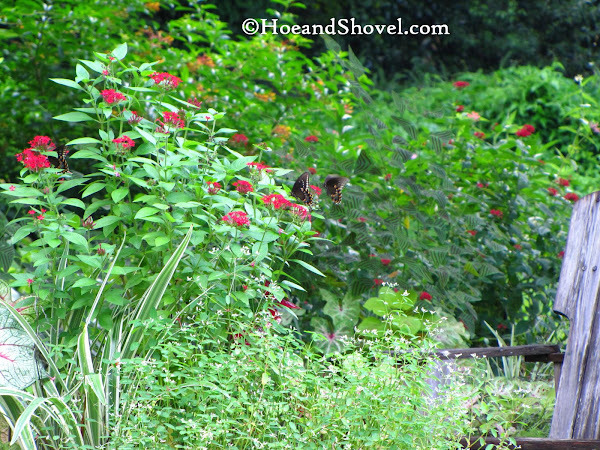 I buy new plants late summer or early fall when they show up in a garden center. My experience with cutting them back is they will produce new leaves on the top but not fill in where they've already lost leaves. Since you just bought the house you probably don't know how long they've been there. I wouldn't think full sun is the best location for them as they need some protection in the shade. Good luck they are a fun plant to have in the garden. I found this plant at a place called Rural King in the town I live in. Spring Hill, FL. Got one last year and loved it, but found out that it can't tolerate the cold we get in winter. Should have brought it in. Was so glad when I found one again this summer and it's doing great in a pot in my screened in pool area and it seems to be loving all the rain we've been getting.